Sausage comes in many different sizes and shapes and varieties, including breakfast sausage, Italian sausage and kielbasa. Sausages are typically formed into links or patties from ground meat such as chicken, pork or beef. 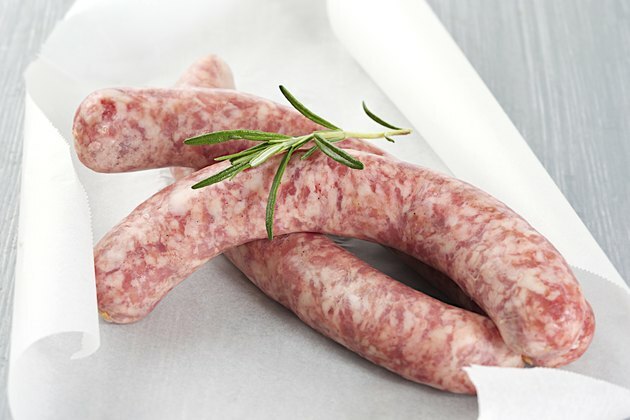 One of the easiest ways to cook cylindrical sausage a is to use steam. Steaming a sausage ensures that it gets thoroughly cooked, because the steam provides heat around all sides of the link. Place a medium-sized frying pan on a stove burner, and turn the burner to medium heat. Put the butter in the frying pan, and wait for it to begin bubbling. Place sausage links into the frying pan with tongs. Cook the links, turning them with tongs, until all sides are brown. Pour a small amount of water into the frying pan so that the entire bottom of the pan is covered with water. Use just enough water to cover the bottom, because excess water can dilute the flavor of the sausage. Place a lid on the frying pan, and cook links for five minutes. Open the lid, turn the links over, replace the lid, and continue cooking for an additional five minutes. Remove the lid, and put the probe of a meat thermometer into the center of one of the links. The sausage is done if it meets the United States Department of Agriculture requirements: beef, pork and lamb sausage must reach 160 degrees Fahrenheit; turkey and chicken sausage must reach 165. Cook the sausage longer, if needed. Remove sausage links with tongs. Beer and wine are two common replacements for water when steaming sausage. Deglaze the frying pan with water, butter of olive oil to get a base for sausage gravy.